Peter Quinn is a fantastic collector who along with a team of reliable volunteers has raised almost £330,000 for charity in the last 10 years. We were delighted when Peter and their trusty team of volunteers decided to raise money for Children with Cancer UK . Peter has been organising street collections in cities in the North East of England for a variety of national and local charities. Initially Peter founded Song’s for Christie’s in 2004 to raise funds for the cancer charity Christie’s. 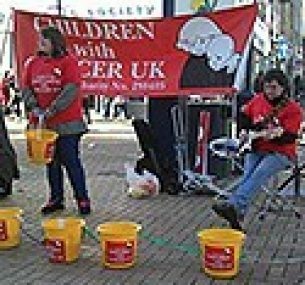 In June 2011, Peter Quinn founded Charity Aid so that they could support more charities through their unique street collections and singing performances in town centres across North East England. Since founding Charity Aid in June 2011, Peter and his team of volunteers have raised a fantastic £116,000 for a wide variety of national and local charities. Peter’s team have 18 collections booked in 2013 for Children with Cancer UK. By April 2013 these collections had raised over £4,700!